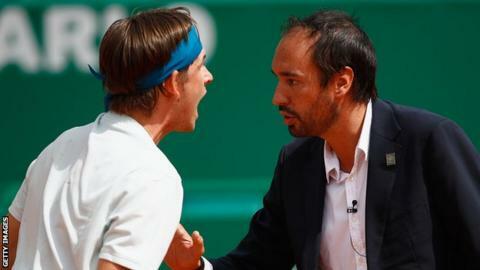 World number 51 Jared Donaldson confronted an umpire after disagreeing with a call made in his first-round defeat at the Monte Carlo Masters. While 6-3 3-2 down to Albert Ramos-Vinolas, the 21-year-old American became outraged when a serve by the Spaniard was called in by umpire Arnaut Gabas when he believed it was out. Donaldson was seen shouting in Gabas' face after calling him on to court. Video replays later showed Donaldson was correct but Hawkeye was not in use. Donaldson eventually lost 6-3 6-3 and apologised to his opponent for his behaviour, but refused to shake Gabas' hand. Gabas was the umpire who suffered an eye socket fracture last year when a wayward Denis Shapovalov shot hit him in the face during Canada's Davis Cup tie with Great Britain. Elsewhere, two-time champion Novak Djokovic defeated fellow Serb Dusan Lajovic 6-0 6-1, while Canada's Milos Raonic came from behind to win 3-6 6-2 6-3 against Lucas Catarina of Monaco. Japan's Kei Nishikori also came from a set down to defeat Tomas Berdych 4-6 6-2 6-1.